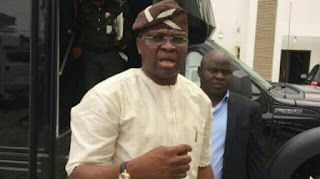 Governor of Ekiti State, Ayodele Fayose has criticized the federal government over the controversial list of treasury looters in the country. DAILY POST reports that minister of Information, Lai Mohammed had released the controversial list of treasury looters at a press conference in Lagos on Friday. Fayose writing on his Twitter page, queried the omission of former minister, Alison Dieziani Madueke, ex-pension boss, Abdulrasheed Maina, amongst others from the list. The Ekiti governor further questioned the authenticity of President Muhammadu Buhari’s anti-corruption war. He wrote “Surprisingly, name of PDP Chairman, Uche Secondus (N200m) is on Lai Mohammed clownish ‘looters’ lists; that of Diezani that they claimed to have traced N47.2bn & $487.5m to was missing. “Did FG lie against Diezani ab-initio or she is now Baptized into APC comity of Saint Looters?